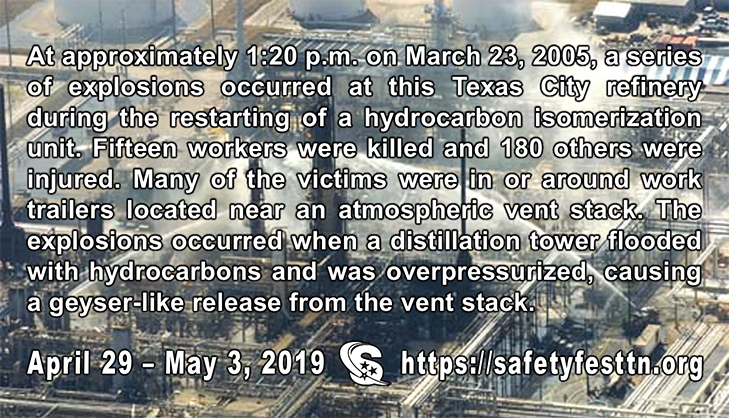 This Texas City Refinery explosion occurred on March 23, 2005, when a hydrocarbon vapor cloud was ignited and violently exploded at this Texas City refinery in Texas City, Texas, killing 15 workers, injuring more than 180 others. The U.S. Chemical Safety and Hazard Investigation Board (CSB) found organizational and safety deficiencies at all levels of the corporation which contributed to the explosion, such as cost cuts and spending cuts in the safety area. Additionally, large parts of the refinery infrastructure and process equipment were found to be in poor condition. In addition, the committee said that the corporation had cut the budget for training and reduced staff. Furthermore, the CSB found that the Occupational Safety and Health Administration (OSHA) had as regulatory authority failed to carry out planned inspections and did not enforce safety rules at the refinery. After the explosion, OSHA found 301 regulatory violations and imposed a fine of $21 million. The CSB also found that only a few OSHA inspectors received the specialized training and experience necessary for investigations at complex facilities. The CSB issued a recommendation to develop a guideline for understanding, recognizing and dealing with fatigue during shift work. The American Petroleum Institute (API) Recommended Practice 755 provides guidance for refineries, petrochemical and chemical plants and other facilities on how to deal with fatigue syndromes. These guidelines include recommendations for work on rotating shifts, such as for the maximum number of overtime hours and the number of days to be worked on without interruption.